Remember when I was experimenting with Logan's Run and how to do it?? Well if you don't you need to find that post and read it! Anyway, I actually did this quick headshot of Anson Mounts as Captain Pike from Star Trek Discovery as the first test. 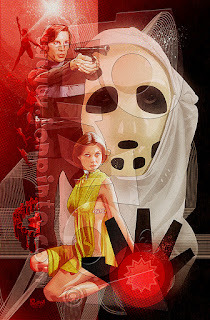 I had forgotten I did it when I was posting about the Logan's Run picture! I must be getting old! So this was the experiment that fired me up to keep persuing this "look". I thought it looked ok when I thought I had it done all on my iPad in Medibang Paint but once I tinkered with it in Photoshop everything changed for me. This was what I was looking for and not knowing it. I really loved what I had and couldn't wait to do more. 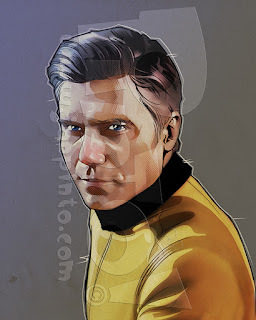 I may even have to do a full Discovery picture to use this Captain Pike picture! 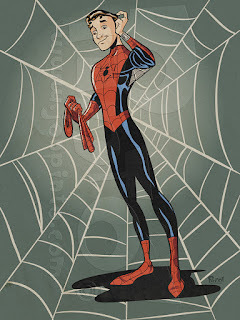 Did I do this before or after I saw the new Spider-Verse movie?? I am betting before as I think I would have added more half-tones to it! I really doodled this on my iPad while watching tv with the wife. Gave it a "Disney(?)" vibe to it for no real reason other than I wanted to. I really liked how the drawing and inking came out so I went ahead and retro colored it the next day. 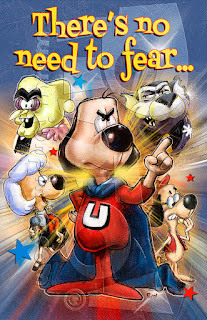 I really loved this show as a kid but now as an adult I find that I love the style and concept most and not so much the actual product. Also shows how times have changed. NO WAY a cartoon character can be shown gaining super powers by popping pills now. My word. Not that I ever tried. I thank my mother for that! Was a super fun picture to do. Mostly done on my iPhone in my spare time here and there. I actually finished this some time ago but never posted it here on my blog until now. Or did I?? I should have checked but I am far too lazy. 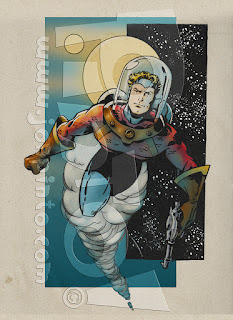 It could be Flash Gordon or Buck Rogers I guess but real aficionados will give me a dozen reasons why it isn't. And they are right. I never intended it to be anyone in particular. It was just one of those moments when I just sat down at my table and started to draw without any plan in place. I was happy how the pencil drawing was so I thought, what the heck! I'll ink it too! And I did. That's where I stopped and then a day later, I scanned it in and digitally colored it. So after my last post test piece, I decided to find an old comp that I had started to try and finish it with a more "comic book" feel to it. 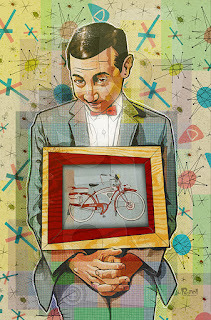 I found that all my prep work for a Pee-Wee picture was almost all done so I settled on that. While it took me a bit longer than normal since there was much experimentation and trial and error as my regular method of late has become almost routine, I am very pleased with the results. I don't think I am where I want it to be though so on to the next one. Just for fun, here is the black and white version.